Researchers in Japan have successfully grown replacement teeth in mice, according to a report in PNAS journal. Tissue containing the cells and instructions for building a tooth was transplanted into the jawbones of mice. They report that these tissue "germs" regularly grew into fully functional teeth with a hardness comparable to that of the natural variety. The work illustrates a technique that could lead to engineered organ replacements, according to the authors. They found that nerve fibres were able to grow throughout the teeth and respond to pain stimulation. 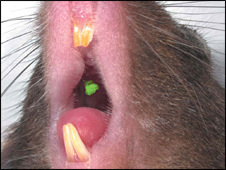 The researchers also tracked gene expression in the engineered tooth "germ" with a fluorescent protein. This revealed that genes that were normally activated in tooth development were also active during growth of the engineered replacement. The study was led by Etsuko Ikeda from the Tokyo University of Science, Japan.